In order to meet excellent quality standards, we are supplying Eco Solvent Inkjet Printer. We are amongst the most reputed names in the industry, offering Eco Solvent Inkjet Printer. - Designed with extensive drying and double-fan drying system, so the picture drying more quickly and thoroughly. - Adjustable heating system of front, middle, rear. - High precision caused by integral machine frame. - Imported brand motor, guarantee its even speed and stability when printing. We are one of the leading wholesale distributors of ECO uv Inkjet Printer. - Cutting Speed: 10 to 600mm / s.
Our company is highly esteemed in offering Solvent Inkjet Printer. - Large Platform Heating after Printing increases the drying speed. 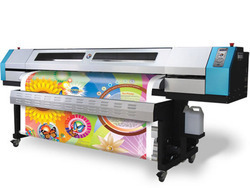 is the ultimate high-volume production tool for stunning indoor and outdoor banners, signs, vehicles, decals, POP displays and more.. India Signera is prominent Manufacturer and exporters of Eco Solvent Printer. Our comprehensive range is known for its simple operations, smooth functioning, Best quality. RK Technologies brings you PRINTLAN Series -Model : ECS32 - a High Quality, Global standard, , Excellent Resolution - ECO SOLVENT INKJET PRINTER - 3.2 m (10 ft ) wide, Dual Print Heads - Epson DX 7, 4 colours, 1440 dpi, 8 pass speed, extremely suitable for Flex, Vinyl, PVC, , PP, , , suitable for Indoor & Outdoor. We are engaged in offering Eco Solvent & Inkjet Printer.